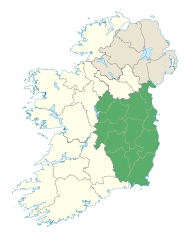 Leinster (English pronunciation: /ˈlɛnstər/; Irish: Laighin, IPA: [lainʲ]), one of the Provinces of Ireland, lies in the east of Ireland and comprises the counties of Carlow, Dublin, Kildare, Kilkenny, Laois, Longford, Louth, Meath, Offaly, Westmeath, Wexford and Wicklow. Leinster has the largest population of the four provinces of Ireland. The traditional flag of Leinster features a golden harp on a green background. The largest city in Leinster is Dublin, the capital of Ireland which has a population of 1,661,185 (2006). The City of Kilkenny has a population of 23,967 (2006). This page was last changed on 10 August 2017, at 21:10.